It’s not uncommon for the modern patient to feel lost among the many technologies present in medical centers. A fascinating study on teaching anatomy examines the surprising harmony of cutting-edge technology and the ancient healing modality of soothing hands-on touch. Brion Benninger of the Western University of Health Sciences in Lebanon, Oregon authored “Google Glass, Ultrasound, and Palpation: the Anatomy Teacher of the Future?”, a study published in the medical journal Clinical Anatomy. Having found no previously published studies on the use of Google Glass and MSK ultrasound to teach anatomy, he presented the technologies to medical anatomy students and found them enthusiastic about this marriage of technology and hands-on learning. Painless, safe, and involving no radiation whatsoever, diagnostic musculoskeletal (MSK) ultrasound uses sound waves to produce images of the inner body. The procedure involves using an ultrasound probe, called a transducer, a small instrument that resembles a microphone. A technician applies gel to the skin and guides the instrument over the examined area. The MSK ultrasound transducer emits and receives high-frequency sound waves, inaudible to the human ear. The sounds that bounce back are recorded and a computer uses those sounds to create an image. This powerful diagnostic tool can provide valuable information for a physiotherapist. What Can a Musculoskeletal Ultrasound Detect? MSK diagnostic ultrasound is able to produce accurate images of the soft tissue, tendons, ligaments, joints, and muscles anywhere in the body. This makes it a particularly useful tool for diagnosis. Diagnostic musculoskeletal ultrasound can identify tendon tears, tendinitis, muscle tears, cysts, and fluid collection in joints or bursae. However, its uses are not limited to diagnosis alone. MSK ultrasound can provide immediate feedback on treatment and can also be used to monitor rehabilitation progress. A head mounted display worn like eyeglasses, Google Glass was used by the students in the study to view the images produced by the ultrasound equipment. The design of the Google Glass device does not inhibit normal vision. Instead of constantly turning away from subjects to view an external monitor, the students were able to stay in contact and communication with the subjects. Another significant change from traditional ultrasound equipment, the Sonivate SonicEye linear finger probe was used in the study. Conventional ultrasound transducers are handheld instruments, effectively coming between clinician and patient. As an extension of the hand, the linear finger probe that was used created a fingertip that could “see” and transmit its images to Google Glass. It occupies a single finger, leaving the others free to provide traditional hands-on contact. Medical professionals frequently say that one can never know too much about human anatomy. The combination of Google Glass and a fingertip ultrasound transducer alongside tactile palpation turned out to be an extremely effective teaching tool. By providing an instant connection between the images created by the ultrasound and fingertip sensations, it created a kind of mental mapping resulting from the synthesis of visual images and sensory input. The majority of students using this combination of technologies reported enjoying the use of the triple feedback method and the desire to spend more time using the method. Although the study took place in an academic environment and focused exclusively on the study of anatomy, the combination of a finger transducer and Google Glass has great potential for use in clinical applications as well. Until this experimental technique becomes widely adopted, however, traditional MSK ultrasound scan techniques remain the best and safest option for diagnosis. Patients report higher satisfaction with their care and treatment based in large part on the amount of contact they have with a medical professional. In physiotherapy, the therapist maintains touch and contact with the patient as part of treatment. 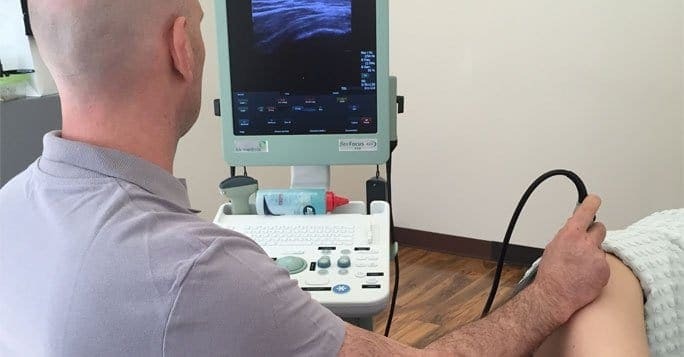 MSK ultrasound provides additional insight for the physiotherapist that, when combined with the healing power of touch and connection, approaches optimum effectiveness. MSK ultrasound is provided by the medical professionals at the New York Dynamic Neuromuscular Rehabilitation and Physical Therapy Clinic. Our highly trained staff and comprehensive diagnostic facility are equipped to treat a wide range of conditions, from sports and repetitive stress injuries to orthopedic conditions. We aim to prevent deterioration, restore function, relieve pain and achieve maximum quality of life outcomes.